SAGE Reference/Major work titles are well researched and presented with an authoritative, interdisciplinary, and accessible approach which makes them invaluable assets for students and researchers. More than 500 must-have SAGE Reference and CQ Press titles are now hosted on the SAGE Knowledge platform. This provides students with the perfect place to start their research on key topics in the social and behavioural sciences. Some of our celebrated major work titles include the SAGE Legends series, which capture the essence of the most important contributions made in the field of marketing and consumer behaviour in the past hundred years. Visit this page as we profile new books and highlight the latest major works by our celebrated authors. 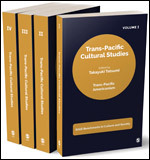 Presents perspectives on traditional concepts of transnational and transregional cultural expression. Captures the most important contributions made in the field of consumer behaviour.